BabyNaturopathics.com - Erzi Spaghetti Noodles In A Tin Wooden Play Food - Baby Naturopathics Inc.
You can earn 10 bnReward Points on this product! 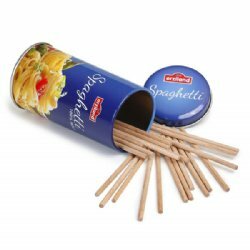 This small tin contains 25 spaghetti noodles.�The noodles are made of unpainted beech wood. Erzi�Spaghetti in�a Tin is�made in Germany.